So, did you know here in the USA it's Women's History Month? Yep-- actually, I didn't know but luckily some other bloggers are on the ball, thank you Erica! 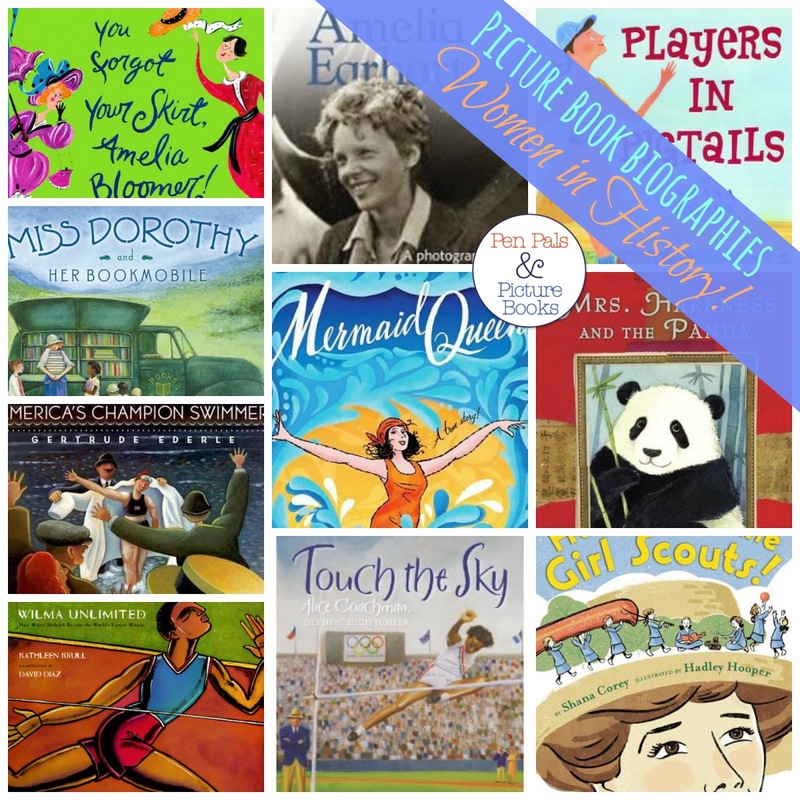 Anyway, since we are biggity big fans of non-fiction around here, I thought it'd be nice to share some of our favorite women's history picture books with you! I adore sharing the true stories of confident adventurous women with my daughters! You Forgot Your Skirt, Amelia Bloomer by Shana Corey. Here's the story of a woman at the forefront of women's rights in the 1800's! Amelia Earhart (DK Photo Biography) by Tanya Lee Stone. This is a chapter book chuck full of photographs and artifacts and sidebar tidbits about the most interesting female aviator of all time! Players In Pigtails by Shana Corey (an author you'll find all over this list-- great stuff by her!) This book is about the All American Girls Baseball League during WWII. Miss Dorothy and Her Bookmobile by Gloria Houston. She had a love of books and a dream to be a librarian, and she didn't let living in the middle of nowhere stop her achieving her goal! America's Champion Swimmer: Gertrude Ederle by David A. Adler another amazing athlete, this time it's the first woman to swim the English Channel! Mermaid Queen: The Spectacular True Story Of Annette Kellerman, Who Swam Her Way To Fame, Fortune & Swimsuit History! by Shana Corey. The title pretty much says it all! Mrs. Harkness and the Panda by Alicia Potter. With incredible drive and, yes, some defiance she completed a mission her husband began and but was unable to finish. The true story of how Wilma Rudolph went from being polio stricken and unable to walk to eventually being an olympic champion! Amazing! Touch the Sky: Alice Coachman, Olympic High Jumper by Ann Malaspina. Awe inspiring determination, overcoming incredible odds, and written in verse-- it's wonderful! Here Come the Girl Scouts! : The Amazing All-True Story of Juliette 'Daisy' Gordon Low and Her Great Adventure again from Shana Corey. Here we have 'Daisy" defying the reputation of delicate and dainty by founding the Girl Scouts!